UNITED NATIONS — At a floral themed and scented luncheon Wednesday, first lady Melania Trump urged the spouses of world leaders to "step up" for the next generation of leaders and patriots. 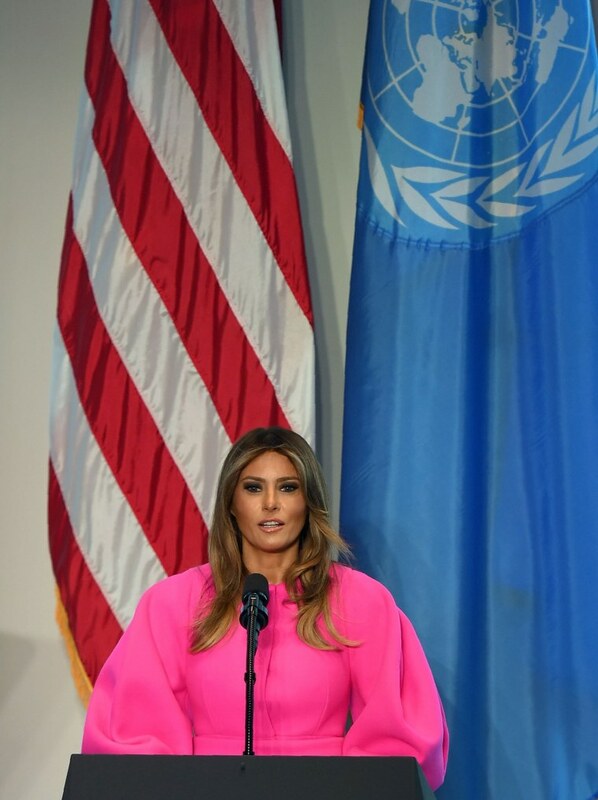 "All too often it is the weakest, most innocent and vulnerable among us — our children — who ultimately suffer the most from the challenges that plague our societies," Trump said, flanked on either side by the American and United Nations' flags and sporting a neon pink bell-sleeved dress. "Whether it is drug addiction, bullying, poverty, disease, trafficking, illiteracy, or hunger, it is the children who are hit first and hardest in any country," she said. "And as we all know, the future of every nation rests with the promise of their young people." Taking in the first lady's words from the front row were other first ladies, including Brigitte Macron of France; Sophie Gregoire of Canada; Emine Erdoğan of Turkey; and Malgorzata Tusk, wife of the European Council president Donald Tusk. Roughly 100 other men and women — the spouses of world leaders or community leaders — were seated in the window-lined room that smelled of fresh flowers. They sipped white wine and dined on baked cod. Among the guests was Rachel Roy, a fashion designer and friend of the first lady. Trump, who has a son, Barron, with the president, has made children a focus over the course of her short tenure as first lady, visiting schools and hospitals while also advocating for child literacy efforts. Though her promised anti-cyberbulling campaign — which she first mentioned during the 2016 presidential campaign — has yet to be announced, she touched on bullying during her seven-minute remarks. "No child should ever feel hungry, stalked, frightened, terrorized, bullied, isolated or afraid, with nowhere to turn," she said, urging those gathered with her at the United Nations to "step up, come together, and ensure that our children's future is bright." As she reminded that the future would be defined by children, several heads nodded in the crowd. Just as President Donald Trump pushed for patriotism and individual sovereignty in his time at the UN General Assembly, so, too, did the first lady. "If we do not advocate a love of country to our children and the generations to come," she asked, then why would our children grow up to fight for our country's founding principles and moral truth?"